For the past... my entire life... I've told myself that I was going to figure out a morning routine that helps me feel refreshed and ready to go. I'm still working on part of it, but I finally have the skincare part down. I've been using this routine for a few days and my skin is so thankful haha! I have a few more skincare products coming my way and I'll update this when I start using them! STEP 1 | Cleanser | Find a cleanser that fits your needs. People with oily skin will need different ingredients than someone with dry skin. I use our Normal-to-Dry 3-in-1 Cleanser. Once summer hits, I'll start using our Normal-to-Oily 3-in-1 Cleanser. Your skin care needs change with the seasons. I use just a small amount, maybe a dime size. STEP 2 | LashExtend | I use our black LashExtend to help my lashes grow longer, thicker, and stronger. I will also start using clear LashExtend at night. I use black during the day because eyeliner gives the appearance of longer, thicker lashes. Just a small bit at the base of your lashes is all you need! STEP 3 | Climate Control | This product helps moisturize your skin to provide the best hydration it'll ever get! It also works with the rest of our products with SenePlex to help aid in cell renewal. You MUST use SeneSerum-C and/or moisturizer after using this product to help seal it in. I use 3 spritzes. One on the left side of my face, one on the right side of my face, and one on my forehead. STEP 4 | SeneSerum-C | This 100% natural product works to repair damaged cells and protect your cells from further damage. It also works as a shield to protect you from pollutants. And like most of our products, it contains SenePlex to help your skin appear firmer, younger, and healthier. I use just 1 pump of this product and massage it into my skin for about 30 seconds. 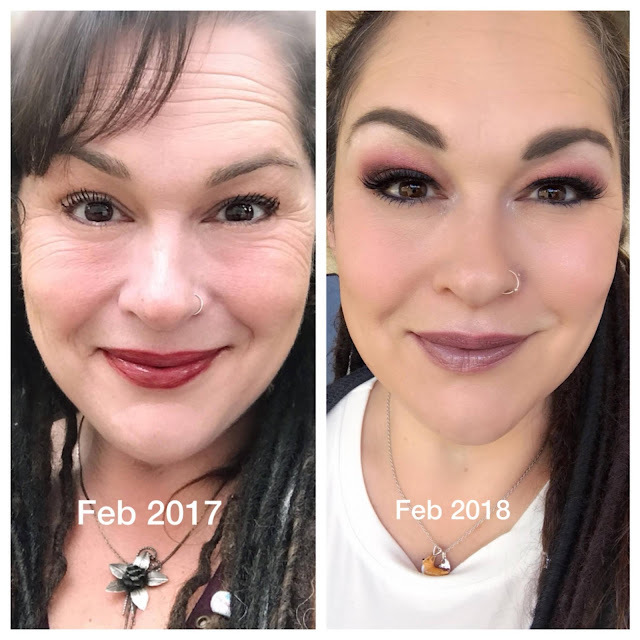 I had to include this before and after photo because WOW! It really shows just how amazing these products are. I was skeptical when I first started using them because it sounds too good to be true, but it's not! It's too good AND true! STEP 5 | Nangai Oil | I'm 99% sure this is the remedy for any problem that you're facing. I'm currently using it to help fade a scar that I've had since I was about 10 years old AND to help erase stretch marks. It's also been used for eczema, dry skin, rashes, and more. Seriously, it can be used for anything. It's also super hydrating and helps lock in moisture without making your skin feel oily or greasy. I use just a couple drops on my stretch marks and a drop on my scar. STEP 6 | Color Correcting Tinted Moisturizer | As soon as I tried this product, I immediately knew why everyone loves it. Not only is it super moisturizing, but it also offers a mechanical shield to protect your skin from the sun while also correcting redness, age spots, and sun damage. This product is suitable for ALL skin types, even if you're prone to acne! It comes in Light or Medium. I use just 1 pump for my entire face! STEP 7 | EyeCreme | Did you know that your eyes are one of the first places to show aging? Think about it: the skin around your eyes is the thinnest on your body and your eyes are constantly moving! This product helps fill in lines and wrinkles while also improving cellular renewal with SenePlex! Just like all of our products, a little goes a long way. And there ya have it! My morning skincare routine. It seems like a lot, but I promise it goes by quickly and it's totally worth it. If you really don't have time or money to do all of these steps, I for sure recommend using SeneSerum-C, Color Correcting Tinted Moisturizer, and EyeCreme. Any combination of our products is great, though! Join my Facebook group, A Good Makeup Day, for more tips, tricks, and promos! Right now, I have an awesome buy 2, get 14% off promo for Valentine's Day and there's a grab bag giveaway. One lucky woman will win it all!